Any attorney who is an active member in good standing of the State Bar of Georgia is eligible for admission pursuant to Local Rule 83.1. If you do not already have one, obtain an upgraded, individual PACER account at https://www.pacer.gov. From the PACER website, click on Manage My Account, and log in using your credentials for your upgraded, individual PACER account. Click on E-File and/or Attorney Admissions, and click Done. Select Court Type: U.S. District Courts. Select Court: Georgia Northern District, and click Done. Select the button that corresponds with the type of PACER account you have currently, and click Done. Complete all sections of the Attorney Admissions request form, upload any documents pertaining to disciplinary actions where indicated, and electronically sign the form before submission. Your request for admission will be sent through PACER to the Attorney Admissions desk in the clerk’s office for the U.S. District Court for the Northern District of Georgia for review and approval. If your request is approved, you will receive an e-mail requesting payment of the $181.00 admission fee through PACER and Pay.gov. You must pay this fee within 30 days, or your application will be rejected; and you will need to re-apply for admission. 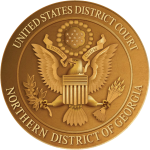 If payment is received on time, you will be admitted to the bar of the U.S. District Court for the Northern District of Georgia and will be given access to e-file in this Court. An optional admissions ceremony is available in the Atlanta division on the first Monday of each month. If the first Monday is a federal holiday, the optional ceremony will be held in the Atlanta division on the second Monday of the month. Optional admissions ceremonies in the Gainesville, Newnan, and Rome divisions may be scheduled by contacting the clerk’s office in each division. If you choose to participate in an admissions ceremony, then you must pay the attorney admission fee on or before the Thursday preceding the ceremony or within 30 days of receiving the email indicating your application has been approved, whichever is earlier.